Model TR troughed slider bed belt conveyors are great for overhead conveying applications with their built-in guard rails. Perfect for moving boxes, cartons, cases, bags, and the like. Can work for loose parts, as well. Take-ups at the tail pulley. Provides up to 4″ of belt take-up. 1/2 HP, 230V/460V/3PH, 60Hz, totally enclosed C-face. Sealed worm gear C-Face speed reducer. 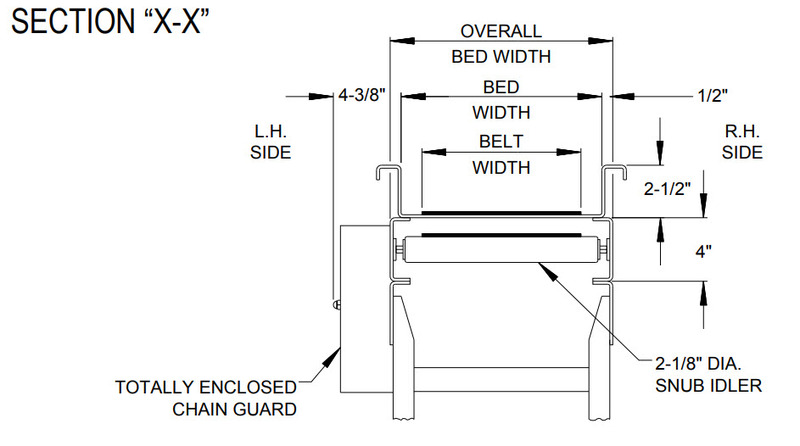 Prevent pinch points that exist when belt conveyors are permanently attached to other conveyors! Use connector brackets with safety pop-out roller (other stationary equipment will require proper guarding and safety devices supplied by others).